The Society Security disability program faces urgent challenges: more people receiving benefits than ever before, the prospect of even more claimants as baby boomers age, changing attitudes culminating in the Americans With Disabilities Act. Disability is now understood as a dynamic process, and Social Security must comprehend that process to plan adequately for the times ahead. The Dynamics of Disability provides expert analysis and recommendations in key areas: * Understanding the current social, economic, and physical environmental factors in determining eligibility for disability benefits. * Developing and implementing a monitoring system to measure and track trends in work disability. * Improving the process for making decisions on disability claims. * Building Social Securitya (TM)s capacity for conducting needed research. 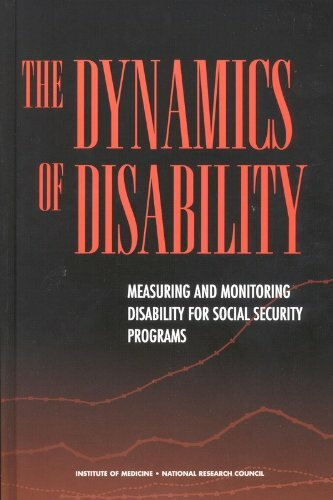 This book provides a wealth of detail on the workings of the Social Security disability program, recent and emerging disability trends, issues and previous experience in researching disability, and more. It will be of primary interest to federal policy makers, the Congress, and researchersa "and it will be useful to state disability officials, medical and rehabilitation professionals, and the disability community.